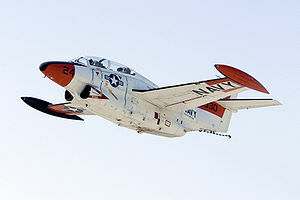 The North American T-2 Buckeye was the United States Navy's intermediate training aircraft, intended to introduce Student Naval Aviators to jets. It entered initial service in 1959, and was replaced by the T-45 Goshawk in 2008. The first version of the aircraft entered service in 1959 as the T2J-1. It was re-designated the T-2A in 1962 under the joint aircraft designation system. The two-seat trainer was powered by one Westinghouse J34-WE-46/48 turbojet. The aircraft was subsequently redesigned, and the single engine was replaced with two Pratt & Whitney J60-P-6 turbojets in the T-2B. The T-2C was fitted with two much more powerful 2,950 lbf (13,100 N) thrust General Electric J85-GE-4 turbojets. The T-2D was an export version which was sold to the Venezuelan air force, while the T-2E was sold to the Greek Air Force. The T-2 Buckeye (along with the TF-9J) replaced the T2V-1/T-1A Seastar, though the T-1 would continue in some uses into the 1970s. Picture: T-2 being parked at Naval Air Station Pensacola, FL on August 30, 2005. Virtually every Naval aviator from the late 1950's until 2004 received training in the T-2 Buckeye, a career spanning four decades. In the Naval Aviator syllabus, the T-2 has been replaced by the near-sonic T-45 Goshawk (the US Navy version of the BAE Hawk), which is more comparable to other high performance subsonic trainers, or the USAF T-38 Talon. More recently, the T-2 has been used as a director aircraft for aerial drones. Several T-2 Buckeyes are now registered in civilian markings and regularly appear at airshows. Picture: A T-2A of VT-7 on USS Antietam in the early 1960s. Two-seat intermediate jet training aircraft, powered by a 3,400-lb (1542-kg) thrust Westinghouse J34-WE-46/48 turbojet. Original designation T2J-1 Buckeye. 217 built. Two T-2As were converted into T-2B prototype aircraft. Improved version, powered by two 3,000-lb (1360-kg) thrust Pratt & Whitney J60-P-1 turbojets. 97 built. One T-2B was converted into a T-2C prototype aircraft. Final production version for the US Navy, powered by two 2,950-lbf thrust General Electric J85-GE-4 turbojets. 231 built. Small numbers of T-2Bs and T-2Cs were converted into drone directors. Export version for Venezuela. 12 built. Export version for Greece. 40 built. Picture: A T-2E Buckeye of the Hellenic Air force.